FaveCrafts (a sister site to AllFreeKnitting) recently gave me the opportunity to go back to my childhood. When I was in 4th grade, my class tie dyed T-shirts, bags, socks and anything else cotton we could get our hands on to raise money for the local animal shelter. In college, the chemistry department had a Tie Dye fun day each year where you could Tie Dye your own lab coat. (Two of these T-shirts are still my favorite cheer-me-up shirts to wear.) So when FaveCrafts asked me if I would be interested in playing with a Tulip Tie Dye Kit , and I JUMPED at the opportunity. I think that it is my love for tie dyeing that got me to start dyeing yarn in the first place. I always loved the creativity (even if I tend to stick to the swirl/spiral method), mess, and colors. This time, my creativity with the Tulip Tie Dye Kit would be to dye yarn and yarn based products (see the end of this post.) Before I opened the free eBook "How To Make Tie Dye Shirts, Decor, and More: 18 Tie Dye Patterns" I was excited to see how others interpret the use of these fun dyes. The book is broken into three different sections, T-shirts and Wearables, Home Decor, and Tie Dye Techniques. The T-Shirt techniques are very different from the ones that come with the kit. I've used syringes, squeeze bottles, and eye droppers to apply dye to shrits, but I never thought about using sponges. My first reaction to the Cobbled Bicolor T-shirt was wonder at how they achieved the cobblestone effect (which is explained quite well.) The other techniques include making a Dappled Heart, Plaid, Starfire Explosion and a really cool Scribble Scrabble that brilliantly takes advantage of color mixing. My only complaint about the eBook is that I wish there were a few more step by step photos of some of the tie dyeing techniques (especially for the dappled heart). They are explained quite well, but since the dye spreads during the 6-8 hours it takes to set, it would be nice to see how much white space is left on the shirt at the beginning and if that changes towards the end. Working my way back to the beginning of the book, you see a lot of great non-T-Shirt tie dyeing options. These projects include a beach towel, crochet pillow, lunch bags, and a wreath. When I took a closer look at the Summer Lovin' Crochet Pillow, I realized that they didn't dye yarn... they dyed T-shirts! These shirts were then cut into strips and then crocheted into a heart shaped pillow. What a brilliant idea! I've seen people use T-shirts as yarn before, but I never thought about dyeing the fabric before cutting it into yarn. Without reading this ebook, I probably would have cut the strips first and then dyed it like I conventionally dye yarn. My crochet skills are limited, but I now have a strong desire to tie-dye an old sheet, cut it into yarn and crochet a "rag" rug... What an inspiration! The T-shirt and Wearables section is technically all top/shirt based. I learned a few great things from this section. Tulip carries a lot more Fthan Dye, they have fabric spray paints, Fashion Art Resist (which makes the shirt NOT absorb dye) and even fabric glue. This section has a lot of step by step guidance, including in my favorite project of the whole eBook, An Apron to Dye For. But, Rebecca, you said that this section was all shirt based... At first glance this looks like an apron that you would purchase, but then you realized that the apron is constructed out of a T-shirt. The project is accompanied with an excellent step-by-step schematic showing you exactly how you should cut the shirt. (I would recommend using a shirt much larger than you normally wear.) I love the uniqueness of this idea! So what did I do with my Tulip Tie Dye Kit? Well I took this opportunity to dye some cotton yarn and completed knitting. Fiber is fiber, after all. Written tutorials for How to Tie Dye Cotton Yarn and How to Tie Dye Knit Projects are available on AllFreeKnitting to accompany the below videos. I still have half of the dye from the kit left (dry in packets.) I'm not sure what I'm going to use it for next, but you can bet that I plan on playing with Tulip products more in the future! 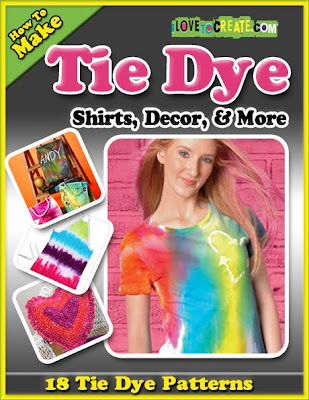 I can say for sure that the How To Make Tie Dye Shirts, Decor, and More: 18 Tie Dye Patterns eBook has left me inspired. Such a great idea, I have never thought of using clothing dye, but it makes so much since! I am glad you enjoyed yourself.